Last Friday, I saw the movie, I Can Only Imagine. In case you haven’t seen it, go. Highly recommend it. It is a story of the lead singer of MercyMe, Bart Millard. Based on the incredible true-life story that inspired the beloved, chart-topping song, I Can Only Imagine is a song that brings ultimate hope to so many – often in the midst of life’s most challenging moments. Amazingly, the song was written in mere minutes by MercyMe lead singer Bart Millard. In reality, those lyrics took a lifetime to craft. The movie vividly displays the abandonment from his mother and the anger directed at him by his father. It is a journey to forgiveness. This movie triggered a plethora of emotions in me. I think I cried throughout the entire movie. Of course, no Kleenex, only a sweater to wipe away my tears. But why was I triggered? I know that whenever your emotional response is greater than the situation, it is unresolved loss that is the culprit. I realized that I was not reacting to mother loss but to my own father loss. My father left me when I was 10 years old. He chose another wife and another family. I was not his special daughter. I was only a reason he had to pay child support. All during my teenage years, I resented him. He was never a part of my life. I lived out the psychological drama of loss by being the girl in high school that every boy wanted to date. I played hard to get. Then, I would make them fall in love with me, only so I could drop them like a hot potato. I cannot remember how many young men I crushed, but I did it with a vengeance. Now I know what I did was hurting my father, over and over, and over again. At 15, my mother died of cancer. When I asked the doctor, “What causes cancer?” His response was, “We don’t know, but we think it happens when there is an emotional trauma” – another reason to hate my father. I knew the person who had killed her – my father. I went through all of my teenage and young adult years hating the man who had helped to bring me into this world. I took every opportunity to wound him as I had been wounded. Like the time he showed up for my high school graduation and I told him he could not come. He was not invited. I became an Emergency Room nurse. One evening, my dad appeared spitting up blood, coupled with shortness of breath – not a good sign. My training told me it was one of the three T’s – tumor, trauma, or TB. No doubt it was a tumor. He was admitted to the hospital. Two hours later, the bitter poison I had swallowed was reversed. I had new insights. New empathy. New wisdom. It was not my fault. I forgave him, and it turned out I was set free. In three short months, he was gone. During those months, I was given the opportunity to care for him and I did this with love. Like Bart in the movie, I saw God work in my dad and in turn, in me. The hard edge was gone. God has used me and my experience as he did with Bart. 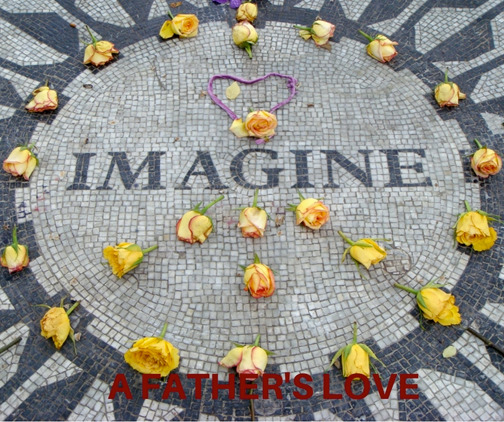 I can only imagine – my father loved me.